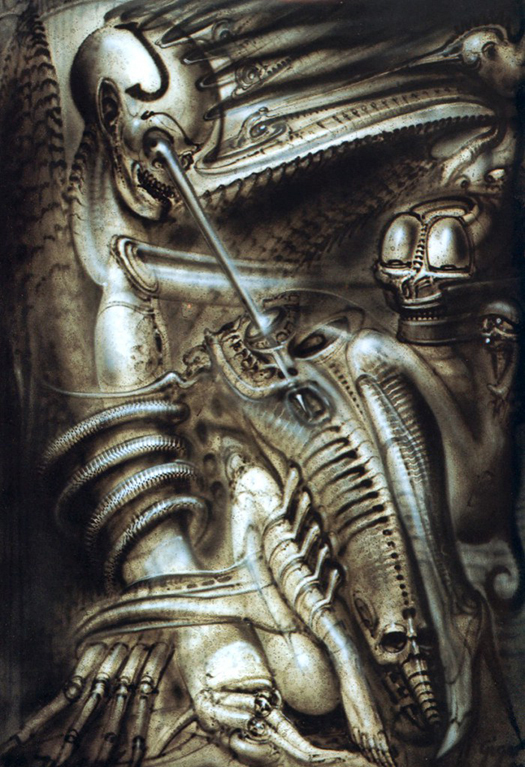 Giger's painting "For Judith" from the year 1983, shows perhaps mainly three biomechanoids. On the left, a tall one with a limbless trunk like body and the letter J on its skull. In the middle there's another biomechanoid staring up at the first biomechanoids face and its as if there's a laser beam going from the eye of one to the other. A third biomechanoid is huddled on the right with large cartoonish bug eyes, sitting ther with its knees raised and lower leg resting along the central biomechanoid's head. The central biomechanoid has tentacles wrapped around the torso of the left biomechanoid, and the central biomechanoid has a face at the lower end of its head. Another tiny biomechanoid can be seen hiding towards the right of the biomechanoid with bug eyes. 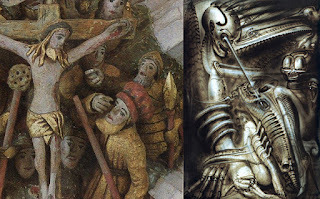 Further exploration reveals the likelihood that Giger saw vague similarities between a Radio Times drawing by Ralph Steadman from the year he was in England working on Alien, and a later crucifixion image from a cover of the Radio Times in 1983. As if the fans who are exploring the racing car have become merged with the people who have gathered around Jesus Christ to watch him die on the cross. The sponges on poles become merged with the caps of the lower racing car fans and the crucifix has transformed into a racing car. But to be more specific, a Roman soldier, to the lower left of Jesus, with his hand over his eye is and offering Jesus a sponge filled with vinegar has become reflected to the right and becomes the chasis of this racing car while holding onto the base of the crucifix in his transformed state. c) See: Comparing the painting to the Radio Times cover from 21st March to 1st April 1983? 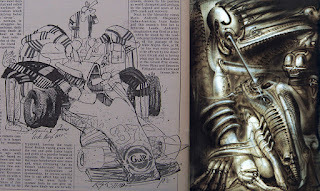 d) See: Comparing the painting to Ralph Steadman's illustration from Radio Times 15-21 july 1978?